Over the last few months, as Pedal Finder began to take shape, we heard a great deal of encouragement from friends and visitors alike. We also heard a lot of suggestions that folks thought could make the site easier to use, more efficient and more pleasing to the eye. The fact is, development to the back end of the website – the part where the sausage is made – happens almost on a daily basis. Subtle changes to the website’s code here and there happen and if all goes well no one will be the wiser. But, we have also been working on changes to the front end – the fun part of the website. And, these are the changes that we absolutely want you to know about. Lot’s of folks come to Pedal Finder thinking it’s all about guitar and bass effects and they wouldn’t be totally wrong. However, a stomp box is just a bunch of wires, diodes and capacitors crushed into a small box with some controls. Granted, many of these small boxes are wonders of engineering and given the right musician are capable of elevating a song or tone to a whole new level. The key here is ‘given the right musician’, because at the end of the day without a dedicated, enthusiastic artist plugging into that pedal, not much is going to happen. That’s why we want to give you the power to explore the aesthetics of other musicians. It’s not just about what pedal they use, it’s about how that pedal is used. What amp, what guitar, what styles. We look at it this way, if you just read the first and last chapter of any book, you’d get the gist of what story that book is telling. But, only by reading the book from beginning to end can you truly understand the whole story. Pedal Finder aims to be the middle of the book and those musicians who take part are the main characters. With that in mind we plan to roll out a whole slew of features to the profile section to give folks the ability to learn more about other musicians and the pedals they use. Recently we’ve added the following features. Band/Music/Business Page Promotion: In your profile you can now promote your band, project or music related business. Just tell us what your endeavor is, and then link to your website or social media page. This will give others a hint of the style of music you’re interested in. Recent Reviews: You now have a listing of reviews you’ve done in your profile. This will allow you to keep track of what you’ve already reviewed and also allow others to see the pedals you are interested in. Giveaway Graph: You now have a graph on your profile page showing how many entries into the giveaway you have accumulated. Reviews are an important part of Pedal Finder and our goal is to give users a broad spectrum of control over how they input, use and track reviews. 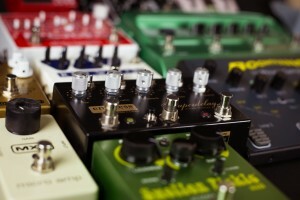 Expect to see a lot of changes in the future on how you can review pedals. For now, we’ve made the following additions. Share Reviews: You can now share your reviews or the reviews of others on Facebook, Twitter or Google+. Thumbs Up: If you find a review useful, you can let that reviewer know by giving them a thumbs up on the review page. This will also let other folks know that you thought it was a quality review and worth checking out. Top Ten Reviewer Graph: On the main page you can now see who the top reviewers are at Pedal Finder. This is determined by quantity, the quality of the reviews is determined by the number of thumbs up a review receives. A few more items that don’t fit in a distinct category! Follow a Pedal: A really useful and fun new feature. This allows you to be notified whenever a member leaves a review on the pedal you followed. Great if your considering a specific pedal, but are still waiting to get more information from actual users. Also works well if you own the pedal and are just interested in what others are doing with it. You’ll find the Follow Pedal button on the pedal detail page. Discussion: Another item you’ll find on the pedal detail page is the opportunity to leave comments about a pedal. Pedal Finder doesn’t have a forum, but we still wanted to give people an opportunity to engage with each other about how they use the pedal in question. Just please keep it civil. We understand there are multiple camps on multiple issues, but I think we can all agree that at the end of the day we are all obsessed with effects pedals. This is just the start and as we implement more of your great ideas -and a few of our own – we’ll let you know all about it right here.